ith a legion of fans world wide, heavy metal legends Iron Maiden have been performing to sell out crowds for the last three decades. 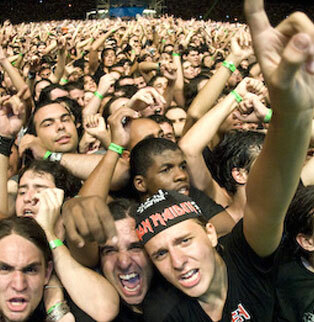 From gigs in North and South America, Europe, Africa, Asia and across the Arab world, Iron Maiden brings legendary concerts of spectacular proportions. Never one to follow common conventions, Iron Maiden and its crew are always looking for new and creative ways to deliver amazing productions to a global audience. 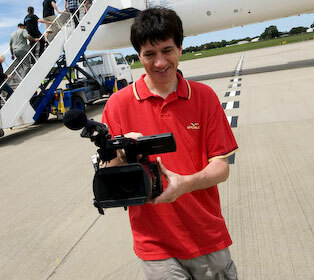 Jet-setting across the globe in 2008-2009 for the band’s “Somewhere Back in Time” tour, Iron Maiden broke normal touring procedures and made rock history by being the first band to consolidate equipment, edit and distribute real-time video footage and photos for news coverage, and the first to transport the band, gear, crew, family and friends in Iron Maiden’s own private Boeing 757 “Ed Force One,” named after the band’s iconic mascot Eddie the Head. Piloted by Bruce Dickinson, the band’s outgoing lead singer with a reputation for showmanship in his intriguing onstage attire as well as commercial airline captain’s stripes, Ed Force One and crew travelled to an astounding 21 cities over 45 days on the first leg. 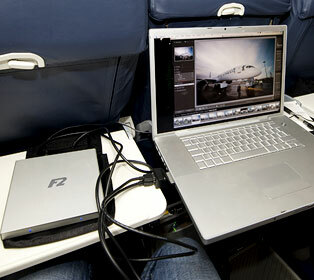 Over the course of this frantic schedule, Johnny B, the band’s videographer, and John McMurtrie, veteran rock photographer and portraitist, were able to capture every detail of the band’s tour in HD video and high resolution photos and store and edit them on Sonnet’s innovative Fusion F2 portable storage systems. The Sonnet Fusion F2 portable storage systems provided an effective storage solution for demanding situations. Quick access to photos was important to McMurtrie, who had the responsibility of providing concert and band images to the press. At the end of each day McMurtrie uploaded new shots of the band to their server based in London. Quick turnaround time was also important such as the time when the band was in Costa Rica, McMurtie was able to send photos from six Australian concerts to media outlets in Sydney, Perth, and Brisbane. The Fusion F2 paired with Adobe’s Lightroom® provided the perfect workflow solution for storing up to half a terabyte of data McMurtrie had acquired over the course of the tour. The tour began with a Mumbai, India show on February 1st and proceeded on through India, Australia, Japan, the United States, Mexico, Costa Rica, Colombia, Brazil, Argentina, Chile, Puerto Rico, and Canada. Eleven Sonnet Fusion F2 system were used throughout the tour with Johnny B shooting concert video, behind the scenes footage, band and fan interviews in HD video (1920x1080) with Sony® XDCAM® EX camcorders and storing everything on the sleek and transportable Fusion F2 portable storage systems. The tapeless workflow included Fusion F2 units with 640GB of storage in an aluminum enclosure the size of two stacked CD cases. The Fusion F2 conveniently drew power through the FireWire® port of a crew member’s MacBook® Pro while data was transferred through a Sonnet Tempo™ SATA ExpressCard/34 SATA host controller. Johnny took advantage of utilizing the Sonnet Fusion F2 systems during mid-flight along with the bands project manager Dave Pattenden and Steve Harris, Iron Maiden founder and bassist, to review concert footage of previous shows for stage performance, lighting, and special effects. Johnny B convinced the band to capture, review, edit, and distribute footage of “Somewhere Back in Time” using the completely tapeless workflow provided by the Fusion F2 portable storage systems as a means to document the revolutionary look of the “Somwhere Back in Time” tour. 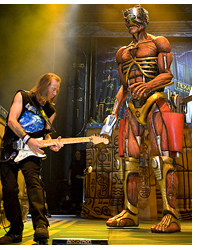 The stage set ups, music, and theme of the current tour were inspired by Iron Maiden’s acclaimed 1985 “Powerslave Tour” and its successful “Live After Death” DVD that showcased the tour. With the Sonnet Fusion F2, the band and crew were able to record shows, review and edit video and photos, and provide new footage to media outlets such as Sky TV, CNN, MTV and Fox TV instantly without delay. The flexibility provided by this workflow also allowed Johnny to edit and segment new video for display on arena Jumbotrons as well as provide reporters from Sky TV and CNN networks with full HD footage, stored on the Fusion F2, and delivered directly to the reporters’ notebooks via FireWire connection. The Fusion F2 systems enabled Iron Maiden with the capability to provide video and photo footage for world press publication anytime, anywhere, and anyhow possible during their tight and busy tour schedule. The Sonnet F2 changed the way we work during the tour,” says Johnny B. “We used it so many places where we had no power, and it allowed us to check edits immediately. We were able to cut videos on beaches in Puerto Rico, and miles up into the Andes. The ability to work with a MacBook Pro notebook and a Fusion F2 just about anywhere—whether we’re at the venue, hotel, airport, or on the plane—was instrumental in helping the success of the ‘Somewhere Back in Time’ tour. I’m typically a location photographer, but the nature of working with a band means that I go where they go",” continues McMurtrie. “In this case, mobility was a must. I couldn’t be reliant on power or held up by equipment that couldn’t handle the abuse that comes with continuous travel and long days on the road. The Sonnet F2 was a new system for me, and I half expected that I’d have to scrap it after two weeks. 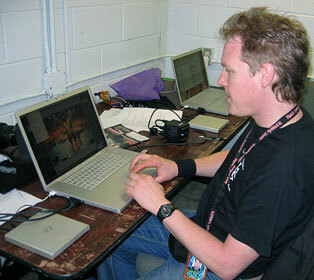 Instead, I’ve been able to leave all my tour photos on the drives and simply label them ‘Iron Maiden’. © All worldwide rights reserved from Iron Maiden 2008. Photo courtesy of John McMurtrie. © John McMurtrie 2008. Photos used with permission.